The Pink Plate Campaign was started by 5 incredible women, all breast cancer survivors who wanted to promote early detection and help more women and families survive this terrible disease. They have put together specialized license plates on vehicles across California (example of the plate in the image below). This is one of the newest plates of California that drivers can purchase. We need about 7500 pre-orders to get this campaign moving forward! The ladies mission is to educate, promote and raise funds for Breast Cancer Awareness, especially in California. Early detection saves lives as they say! All funds generated from sales of the California Pink Ribbon License Plate will be deposited into the Breast Cancer Control Account, which funds the Every Woman Counts (EWC) program. EWC is administered by the California Department of Health Care Services (DHCS) and provides free clinical breast exams and mammograms to California’s underserved women.The mission of the EWC is to save lives by preventing and reducing the devastating effects of cancer for Californians through education, early detection, diagnosis, and integrated preventive services, with special emphasis on the underserved. The EWC program partners with county departments of public health and county health consortia across California to provide women with local, easy access to screenings. We know that early detection is critical in treating breast cancer and increasing survival rates. Money generated from the California Pink Ribbon License Plate will allow more women across California to get regular breast exams and mammograms, potentially saving the lives of countless women. 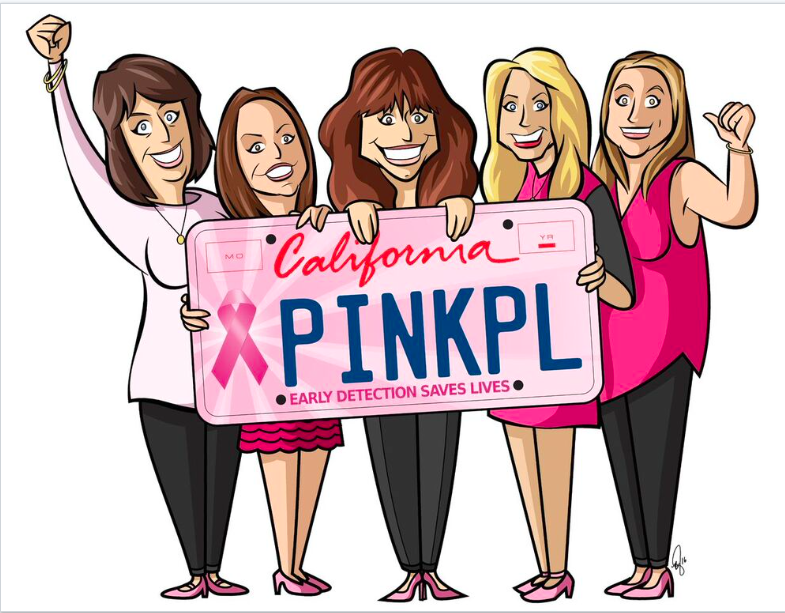 The California Pink Ribbon License Plate was started by a group of Breast Cancer Survivors in Northern California that wanted to make a difference. Each survivor had a different journey but they all had the same goal; to provide education and support for Breast Cancer Awareness.The State of California is fortunate to have many non-profit organizations that work tirelessly to promote and educate the public and raise money for Breast Cancer Awareness. But we can do more. This group of courageous women, each with gripping stories about their struggle with this terrible disease, had a great idea – a Pink Ribbon License Plate. We cannot think of a better way to proudly display our support for women battling breast cancer and to remind all of us that early detection saves lives. Chere Rush: At age 39 she discovered she had a lump in her breast and diagnoised her with Stage IV Invasive Ductal Carcinoma in Situ and gave her two years to live max. A wife and a mother of 3 boys, “If I had gone to the doctor months before, I believe I would not be in the battle that I am in right now.” In remissions, she will always have Stage IV Cancer. (BIO available on request). Heather McCullough: Stage IV Breast Cancer survivor, who was diagnosed 4 years ago at the age of 36 and underwent 18 weeks of chemo and 4 surgeries. Who has 4 amazing boys (6-20 years old) and has been married for 22 years to her high school sweetheart. Her diagnoses came as a surprise since she has no family history of Breast Cancer and just had an exam just a year prior. She ignored the signs until she felt a lump in her breast one day. Deborah Bordeau, 55, of the Bay Area city of Brentwood has been a teacher for more than three decades, including 25 years in the Oakley Union Elementary School District. In 2010, she was diagnosed with breast cancer. Her positive and empowered attitude, early detection and supportive network of friends and family helped her through treatment. In 2013 she was invited to be an American Cancer Society “Hero of Hope” and shared her story to help others along the way. The fifth grade teacher was named Contra Costa County Teacher of the Year in 2012. She is five years cancer free and calls herself “blessed” to be enjoying all of her life’s passions including her family, pets, swimming, traveling, skiing, good friends and good food. mammogram in 2009. Faced with difficult choices, the mother of two decided to undergo a double mastectomy. After 14 hours in surgery, doctors told her they had found malignant tumors in both of her breasts. She considers herself “one of the lucky ones” for her early diagnosis and says early detection saved her life. Kimball and her husband have tirelessly advocated to make “CA Pink Plates” a reality. Heather Solari, of Oakley CA, learned she had breast cancer just a few months after losing her mother to the disease. She was 25. Testing showed she had the breast cancer gene and she elected to have bilateral mastectomies and a complete hysterectomy. Several chemotherapy treatments, and a half of a dozen surgeries later, the mother of a 9-year-old daughter’s cancer has been in remission for four years. Her battle helped spur her to pursue her dream job as a San Leandro Public Safety Dispatcher. She hopes to “paint the roads pink and bring awareness” in California through the Pink Plate campaign. You can get more information about the movement at www.pinkplate.org, you can even give someone a California Pink Ribbon Plate as a gift!